What has happened to Jackpot? Phil ‘The Power’ Taylor prodigy, Adrian Lewis, was the hottest thing in darts several years ago. Winning back to back World Championship titles in 2011 and 2012 respectively it seemed nobody could stop him. However, he is currently ranked 16th in the PDC order of merit which means he just qualifies for the major tournaments without having to qualify via the many Pro Tour Events. Fans that know Adrian also know he is more than capable of returning to top form and winning more titles and on his day, he can beat any of the top-seeded players that currently rank higher than him. So, what of Adrian’s nickname ‘Jackpot’? Readers of my websites know I keep a compresence list of players nicknames and many of the player's nicknames are either a play on their surname or have some reference to their former work. But where does ‘Jackpot’ come from? In 2005, at the age of twenty, Adrian was in the USA playing in a World Series event, the Las Vegas Classic. Vegas is known for its many gambling casinos, slot machines and is a betting paradise for some. 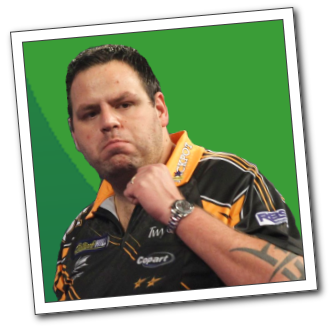 That included the young Adrian Lewis. Having played many of the slot machines in the UK Adrian decided in his spare time away from the oche to have a go the fruit machines and he hit the ‘Jackpot’ $72,000 which equated to £50,000 at the time. Lewis' slot machine success was, however, short-lived as he could not collect his prize because he was under 21. Although he couldn’t collect the winnings he gained a good nickname and has been called ‘Jackpot’ ever since. A big price to pay for a nickname, but one that will always lodge in people memories. At very least Adrian can say something good came out of it! Adrian, loss of form over the past couple of years has been caused mainly due to a back problem. In 2017 Adrian had to withdraw from a number of events including the World Series events, the Shanghai and Las Vegas Masters he also missed, the Dutch Masters UK Qualifier and European Pro Tour events in Austria and Leverkusen. Hence to say Adrian was unable to defend any prize money that he would have earned the previous year. This has meant his PDC order of merit ranking has dropped. Adrian has since undergone successful back surgery and his return to form has been good but slow. Adrian will return to our TV screens on the 1st October in the PDC World Grand Prix where he will face an on-form Michael Smith. These players are evenly matched and with a double start double finish, this match could go either way. Neither of these players has won this event, however, Adrian made the final in 2010 losing to James Wade 6-3. Smith, on the other hand, has had recent success in the World Series of darts. Smith won the Shanghai Masters. The PDC World Grand Prix 30th September – 6th October. A total of 32 players, 16 from the PDC Order of merit and a further 16 from the Pro Tour order of merit qualifiers. Adrian will play his first-round match on day two.